Until the 31st of January, the French clubs can make some adjustments to their playing staff. Here is a reminder of the FFF regulations. From this season, a new rule allows players who have played for a Division 1 team to play for another D1 team. Nevertheless, this rule only applies to players under pro contract ” contrat federal” who are loaned to other clubs. Article 22 of the regulations of the D1 and D2 championship. Players can change club outside of the normal transfer window from the 16th of July 17 to the 31st of January 18. Each season the amateur players, can move a maximum of two times. For the players moving outside of the normal transfer window, the new club must obtain the agreement from the player’s previous club, except in special cases. Article 92 from the general regulations from the FFF. D1 Feminine club can loan up to four players during one season. D1 and D2 clubs can only sign a maximum of three loaned players in the same season. Loan for players under pro contract are set for one season maxium, the agreement can can be extended. The loan can be organised only if the player is over 18 years old. Article 1.5 from the Statut Federal de la joueuse. 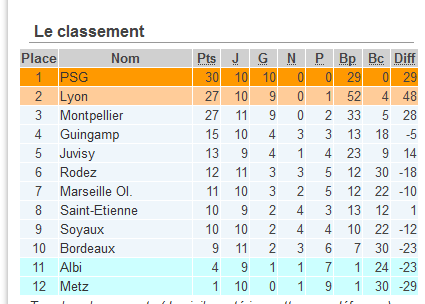 There was an important game at the top of the table and it might decide who will get in the Champions League next season, depending on what will happen for the OL PSG and MHSC OL games. Some big results at the top of the table with Montpellier beating PSG, the first time MHSC has beaten a top 2 team in the League since Jean-Louis Saez took over the team. The Swedish mafia ( Jakobsson, Blackstenius) scored for Montpellier. Juvisy lost ground in midweek, won on Sunday and announced tday that they would start merging with Paris Football Club. Clearly their amateur/ semi-professional model is not competitive against full time professional teams and they had to make a change to survive and try to be competitive again. There was a lot of hype for Alex Morgan’s debut away to Guingamp and she started the game with Ada Hegerberg being dropped to make way for her. Hegerberg subbed in for Le Sommer at half time and Morgan lasted 73 minutes and was replaced by Lavogez. The current table is distorted with teams having games in hand all over the place. Metz are likely to go down unless they start winning games, while the second relegation place is wide open. In theory, no one except the top 3 teams are safe. Of course it will depend on Albi’s results with their two games in hand because if they win those, they could go as high as 7th in the table. At the top the situation is clear, PSG are in danger of not qualifying for the champions league, a first since QSI took over the women’s team properly and bankrolled the changes. Lyon can finish the season with 63 pts, Montpellier with 60 pts, PSG with 59 pts maximum, unless they can get something on appeal from the Matchday 1 game lost by penalty. PSG obviously hoping for the game to be replayed and then win it again. After a week-end dedicated to the French Cup, it is back to the usual business with the D1 feminine matchday 12 that could see Alex Morgan make her debut for Olympique Lyonnais while Amandine Henry could make hers for PSG. First, there is a postponed game form Matchday 7 to be played on Wednesday between Saint-Etienne and Juvisy. Then next week-end we will have the full fixture list on Saturday and Sunday. Note : PSG have been given a 3-0 defeat to Albi in Matchday 1 and a penalty point as well so there are currently in 3rd place with 26 points as their appeal is not suspensive. During the opening game of the 2016/17 season PSG v Albi, Sarah Palacin played while she was not named on the team sheet, as another player’s name was registered. The verdict from the disciplinary commission was given today and sees PSG penalised with a defeat by penalty and Albi get the win. It was either the game to be replayed or a defeat by penalty, as PSG had now been waiting for more than two months for the decision about the game that was played on Matchday 1. It ended PSG comfortably winning by four goals to nil. An administrative error happened with Sarah Palacin who was not named on the team sheet came on as a sub. In her place Hawa Cissokho’s name was put on the teamsheet, while she was not there as a substitute on the bench. As a reminder, the Division 1 feminine is using the electronic team sheet for the third season. In order to fill up the matchday teamsheet, the teams no longer write-up the player’s name, licence registration number, date of birth etc, they simply click on the players names on the matchday tablet. It is probably because of a lack of concentration or attention that Cissokho ended up instead of Palacin on the teamsheet. On the team sheet, it was mentioned that there was a “technical problem” in the post game observations area. In that box, it was written that for PSG number 9 had replaced on the 46th minute number 20. That point had to be cleared and an enquiry had been opened in order to gather all the needed information to take a decision. The Federal commission had to examine that case before returning judgement on the final scoreline. It could have been a complex case scenario. Both captains had signed the team sheet before the game and therefore agreed on the team’s line-up. In that case, it was decided that Palacin coming on as a sub was a player participating in a game where was not registered for on the teamsheet. As one player had taken part in the game, while she had not been registered on the team sheet prior to the game, her team was in breach of the Reglements Generaux regulations from the FFF related to playing in a game. The fact that the referees did not realise, before the game, that there was a player not listed on the team sheet that could enter the game and play, does not exonerate the team from its entire responsibility in the fact that there was an irregularity during the game. This is due to the fact that the captains have an obligation to check, with the potential help from the club executives, the players list and squad numbers from their team. The referees should not bear that responsibility, as they do not have the capacity and the means to manage it especially as it could lead to an abuse of the system. The commission put the decision in deliberate and communicated it to the club today by giving the game lost by penalty to PSG and Albi to get the win. PSG loses the three points from the victory as well as an extra point as a punishment ( for the error). Albi gets the 3 points for the win and the scoreline goes by 3-0. Top of the table before that decision, PSG should probably appeal the decision. With that punishment, they dropped to the third place with 26 points, behind Lyon and Montpellier with 27 points. The club has 10 days to appeal, once it has been officially notified of the punishment.